Last night my very good friends came for dinner. I made some salsa and guacamole, bought some hummous (is that how you spell it? I never know), doritos to dip. ... and I made chimichangas! Vegetarian (are they usually? ), with onion, peppers, tomatoes, (little teeny ones), mushrooms and chilli. I added some ground cumin and coriander. Then grated cheddar and feta. Wrapped all this up in tortillas, just enough for six, then I baked them instead of frying. Grated cheddar, sour cream and spring onions on the top. They weren't so crispy as you would get in a restaurant, but better I think. And hot smoked paprika new potatoess. Salad on the side, and my girls were happy. 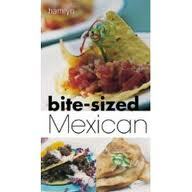 The cookbook I used was called Bite-Size Mexican (published by Hamlyn) and I used it for the chimichangas and the guacamole. I found this book in a charity shop years ago and I've used it many many times, so simple to follow, always happy with the result. For the salsa I used my sister's recipe, using little cherry tomatoes (which just sweetened it up a tad), garlic, chilli, spring onions, squeedge of lemon juice and fresh coriander.. The girls took the 'leftover' salsa and guacomole home for their boys! And Rachel Allen Easy Meals provided the potatoes, although she uses wedges. So a delicious evening. Simple really.